Futsal has gone through several rule changes over the years. Firstly it was to unify the different variations played across the world and, more recently, to improve the game. The size and weight of the ball was standardised with a size 4 being decided as the best choice for TV coverage. The regulations regarding the fly goalkeeper (when the goalkeeper helps with the attack in the opponent’s half) have been adapted to discourage this tactic being applied too frequently which can lead to less dynamic action and a reduced spectacle. These modifications are possible because futsal is a relatively new and developing sport which is not so entrenched in tradition and there exists a desire to make it as attractive as possible for players and fans. Below are 5 rules I would change to enhance the game. For the 2006/2007 season restarts with the feet were introduced whereas previously throw ins were taken. Throw ins produced many spectacular goals. Any fan loves to see a perfectly executed volley. The introduction of kick-ins has resulted in fewer goals and less stunning ones. In the season after kick ins were introduced the average goal per game went down 6% during the regular phase of the Spanish Premier Division. For this reason I would reintroduce throw ins when the ball goes out on the sidelines. By doing this we would again see these eye-catching and beautiful goals. However I’d maintain corners taken with the feet. This would retain this aspect of the game and would also standardise the rules with football which helps when introducing people to the sport. For those that disagree I have made the following video to try to change your mind! Two halves of 20 minutes stop clock with a 15 minute half time interval means the average futsal match lasts about 1 hour and 15 minutes. This is a little short compared with most other sports such as basketball, football, rugby and tennis. Since 2009 the Russian league has used 25 minute halves after claiming that surveys showed supporters would like to spend more than the 90-100 minutes at a match. We should research what supporters prefer. I think the same duration as used in NBA basketball would work well with four quarters of 12 minutes stop clock. Intervals would be a 2 minute break between quarters and 15 minutes for half time. This would result in a high intensity being maintained during the game and increasing the duration of a match. When an attacker is alone against the goalkeeper there are too many deliberate fouls from a recovering defender. The player makes a cynical and tactical challenge to prevent the attacker from progressing knowing that they will receive a yellow card and a free kick which offers a much reduced possibility of a goal being scored. The frequency of these fouls in this type of situation demonstrates how the outcome is heavily weighted in favour of the defence. Seeing a goal scoring opportunity purposely denied is not enjoyable for spectators and not fair. I am not sure if this is an issue with the rule or its interpretation. However I suggest if the foul is deliberate the player should be shown a red card. There would be some issues with determining whether the foul was on purpose or not and for this reason I would have a red card issued only if it clearly was. A more interesting alternative would be for player to receive a yellow card but award the attacker a free kick with no wall or a 10m penalty (as is currently the case with the 6th accumulated foul). Either of these options would be a solution and would lead to more goals scored, making the game more entertaining. Slide tackling was recently allowed after previously only being allowed to slide in order to block. This was changed because of the difficulty for the referee in determining between a block or a tackle, though I rarely found this to be an issue. I think the approval of slide tackling has caused a more significant problem of attacks being disrupted too frequently by slide tackles. 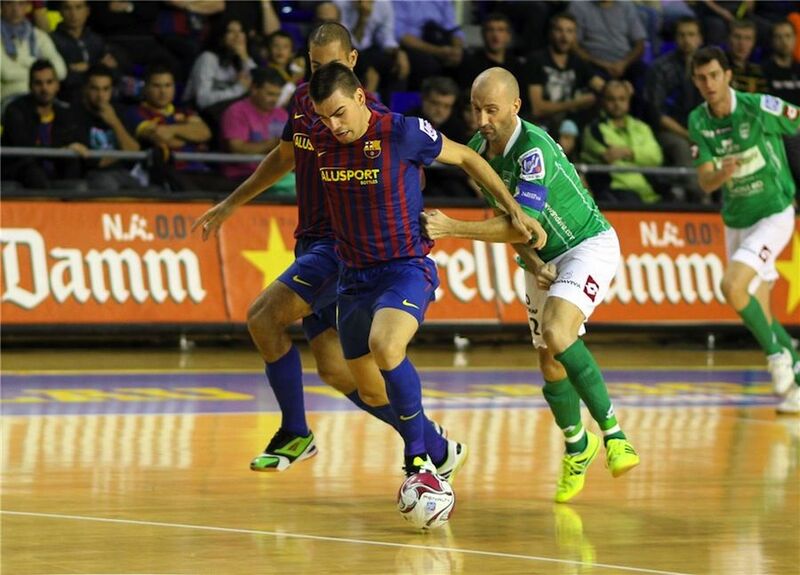 In futsal the players are always in close proximity and it such a high tempo game that the opportunity to make a slide tackle appears too often. Further the hard surface can result in a painful landing and possible injury risk for the attacker. Therefore I would return to only allow sliding to block though we could just remove sliding altogether. The reduction of sliding would decrease the number of interruptions when the mop is used to clear the court of sweat. Currently most competitions use two extra 5 minute periods followed by penalties to decide a knockout fixture. I find that in these 5 minute periods both teams usually play very tentatively and cautious. This is illustrated through the fact that it is rare to see the fly goalkeeper introduced when the scores are level. Neither do I think penalties are a good way to decide a game. Chance is too much an important factor and they are rarely that entertaining unless the outcome is very important to you. A 6m penalty gives the goalkeeper no real time to react to the strike of the opponent. Thus probability and chance are quite decisive to the outcome. I am not denying skill still has an influence. A team is more likely to win if their attacker is able to smash the ball in the corner or their goalkeeper is able to anticipate the direction of the shot through the body shape of the taker. My suggestion for a better way to decide a winner would be to introduce three 5 minute periods where each period one player from both sides is removed. So the first 5 minutes would be 4v4, the second 3v3 and the third 2v2. After this we would be forced to decide the winner through penalties though I would anticipate these would rarely be required. The additional space available to the players would make it easier for the team attacking and thus lead to goals. I think it would also add an interesting tactical element and provide some fascinating duels between players. Do you introduce 2 strong attacking players when in possession and quickly change for 2 better defensive players when you lose the ball? Once it gets down to 2v2 (1v1 + goalkeepers) it would be especially enthralling and we would see some amazing actions. Imagine the intriguing battle that would have taken place if the recent World Cup final had been decided with Falcao’s dribbling pitted against Lozano’s power. Or picture the excitement of watching a desperate attempt to rescue a game by a team a goal down employing the goalkeeper player to create a 2v1. I think this rule change would give futsal a unique aspectthat would differentiate it from other sports and provide a very interesting spectacle. In recent years the average goals per game has continued to decrease. This season it is down 13% in the Spanish Premier Division compared to 05/06. It is often now to have few or even no goals at half time (usually there are a few goals by the end of the game as one team employs the risky strategy of using the goalkeeper player). This reduction is not solely down to the rule changes as the tactical organisation and intensity of defences has improved. However it does not mean we should not address the issue through modifying the rules. The trademark characteristic of futsal is thrilling and high intensity attacking action and I believe we must foster and promote this quality for the benefit of the sport. This can be achieved through revising the rules. Do you agree with my suggestions? If not, why? What would you change or would you keep everything as it is? I am writing this update after the PFL (upcoming US pro league) announced some rule changes they will apply (few of the ones I suggested with an adaption to the one about deciding a tied match) which caused some debate. They have adapted the rule about a game ending in a draw with reducing the number of players. I actually prefer their idea which is one 5 minute period of extra time of 4v4 (3 outfield plus goalkeeper) and if it is still a tie they go to penalties where the attacker has 5 seconds to score against a goalkeeper from the halfway line. Though I would like to see how 3v3 would go, certainly my idea of going as low as 2v2 would be too much space for those limited numbers and too tiring. I like the idea of the non-traditional penalties as they would create some great clips for social media which is key to marketing sports in today’s society. Plus watching a 6m penalty being smashed with a goalkeeper trying to get in the way but with no time to react is not entertaining (unless you like to see someone get hurt!). A new rule I would like to suggest is changed is from dead ball situations where there are 4 seconds to return the ball into play. In practice this lasts much longer than 4 seconds as teams delay, discuss what set piece they will do, make substitutions etc. Maybe it would be better just to start a 12 second countdown as soon as the ball goes out (a referee can use their common sense if a player has to go far to fetch the ball) to maintain a high tempo to the game? Another rule I have previously suggested is changed is to stop the fly goalkeeper from being used just as a means to maintain possession without an intention to score through the implementation of a back court rule. I suggested this with my reasons HERE a couple of years ago and again HERE last year. Any rule change would need testing and to see how it would work in practice and if they are any unforeseen consequences. For example, would throw-ins really result in more frequent goals of a spectacular nature being scored? What is the difficulty of scoring against a goalkeeper in 5 seconds? When changing any rules the key is to consider whether it will improve the sport in terms of enjoyment for players and spectators as well as maintaining its essence. Hi Doug…I like a lot of your ideas, especially the ones on duration and alternatives to penalties. My concern is that these changes would certainly not be immediately accepted by the respective organisations. Your suggestions are for the purpose of making a better product for spectators. To properly support this from a commercial perspective a more radical idea of mine for futsal in England in the future would be a franchise system, with these rules being adopted. This association would probably have to be separate from the FA, at least initially, because it wouldn't be FIFA rules – arguably this is the best path for English futsal anyway. It would be based on the American sport, perhaps with a draft system as well. Their structure has proven itself to be more successful commercially, and has proven itself to provide fairer competition. It would also be centrally managed. Presumably your intention is to make futsal a viable commercial product – I personally think that this would be the best way of making that happen. Thanks for your comments Joe. I think your proposition is an interesting one and it would be great to see how the draft system would be taken to in England. I certainly think it could work. You also make a valid point about having a separate association. This is something that works well in Spain and Brazil though they still have a relationship with the football federation. It is something that might have to be copied in England for futsal to develop that is best for futsal. I definitely believe that futsal should not copy the way other established sports do things as we will be competing with them and that will be a very difficult task. I think futsal should be innovative and find it's own path and ideas, such as these ideas you suggest. Why do you think these rules could not be adopted immediately? I don't expect they will because I presume you need agreement from the majority of associations and that takes time. Is this the reason you say this or something else? I'm from Pasion Futsal http://www.pasionfutsal.com.ar (Argentina) and I found your article on Rule Changes pretting interesting. In fact, I discussed many of the ideas you mention while in the last two WC at Brazil 2008 and Thailand 2012 with the FIFA TSG that included coaches like De Luise, Hermans and Martic. And I'd like to share my view on each one of them. 1-Throw in (the Spanish idea): I think we should introduce this rule (used by AMF Futsal) as a test in junior divisions to see if it can work, and maybe put it like in Beach Soccer (the player has the option to throw-in or kick-in). In Argentina, we usually disagree with the idea from the danger to the players from getting hit while fighting for the ball at the time of a header because this rule is used in the 6-a-side local version of indoor soccer called 'baby futbol' and most teams end up playing only this way (throwing the ball to the area) disreagarding absolutely to improve the other skills and making the game to look awful with the ball mostly flying than rolling. 3-I suggested FIFA once to introduce the 2-minutes suspension just like Handball for tactical fouls (the player can return) and extending the red card to 4 or 5-minutes. I also proposed to take the 'flagrant foul' just like basketball, awarding a 10m penalty, no matter how many accumulated fouls a team has. 4-I think we should return to the old rule of prohibiting slide tackling. 5-Impressive idea! I think you took it from the FIFA video game (eliminating players). I would played only one 5 minute extra period, instead of two. I would modified the distance to free kicks and kick-ins to 6m (and redrawing the 3m center circle as well). Thank you for your comments Patricio. 1. What size goals are they using in this 6-a-side? I would expect it would be difficult to score directly using this method in futsal goals and it would be much more effective to create a set move to score. I never saw that take place in Spain but I agree if this happened then it would not be good for the game. 2. I think medically there is no problem as FIFA now allow 14 players to be named allowing players to not get too tired. I think we must find out what spectators prefer and if that is two 20min periods then let's leave it at that. 3. I think both of these are good ideas. A 2 minute suspension is good. I really like the idea of a flagrant foul resulting in a 10m penalty. I think that would be an excellent rule. 5. Haha. I have never played the FIFA video game! Others – I don't think there are too many fouls at the moment (more the type of fouls being the problem) so I would not reduce the accumulated foul count personally. I don't think we should have a passive play rule. Playing with the feet makes scoring a goal/point much more difficult (as shown by the different final scores in the respective sports) so I think a time rule would not allow an effective positional attack to be made. A team without the ball could retreat to 12m making it very difficult to score within the time limit. I don't find that the majority of possessions last too long especially if the other team don't stay back. Thanks again for your opinions. I enjoyed reading them. Another rule change we've forgotten is the Spanish proposal for forbidding goalkeepers launching the ball with its hands across the midfield line after the ball is out from the goal line (the goal-in). This rule is used in junior divisions in Argentina (firstly because pitches are usually small and secondly because to prevent games to became a tennis or ping pong game between the goalies). But the reason Spaniards give is that this would allow teams to pressure more the rival's defense, rather than leaving a defender for the risk of a fastbreak. They say that this will only apply to this case, and the goalie will be allowed to throw the ball passing the half line when it's a live ball (example, after catching it from a rival's shot). All proposals to change the rules of this article and the comments are very good. However, I think the rule should be changed urgently is to prohibit any defensive sliding tackle. This rule is killing the game because its favorable for defensive and destructive style of play which almost no one likes to watch. Futsal field is small in size, and even for best players it is almost impossible to slip the ball to a goal whether it be on dribbling, passing or creating space for a shot on goal. It is also very dangerous for players due to severe injuries. Referee’s criterion is also ridiculous, the intensity of the contact is tolerated is often stronger than in football. Considering how FIFA and UEFA are conservative organization, do you think it is likely that in the near future can be expected to change the rules and, if so, which? I agree with you and made this point in the article. Not suitable for the small space in futsal where everyone is in close proximty. Only FIFA can change the rules, not UEFA. It was only fairly recently they reintroduced slide tackling so can’t see them removing it in the near future.